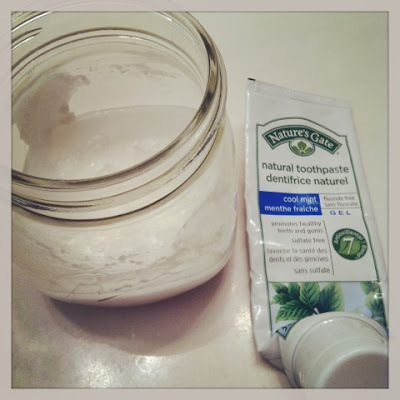 I declared on Instagram over a week ago that I had finished up my last tube of natural toothpaste. That $3.29 tube was the last tube I had plans on buying. I told myself when it runs out... we go to homemade. I do that to myself a lot. When I know there is a superior homemade version and I can do it for far less money and it is convenient... WHY NOT? I was up really early that morning and I went and gathered my supplies. It will be a bit soupy at first, but if it gets cold in your house like it does mine, it will firm up. Dab a little on your toothbrush, and brush! I couldn't believe how terrific my teeth felt! And my breath was fresh even after a couple of cups of coffee! I talked about it all day! You don't have to super scrub it because the baking soda is abrasive. You don't want to go TOO hard. It works fantastically! The whole family likes it. No floride! No sodium laurel sulfate! No glycerine! So each one has a jar, with their name labeled and we are now even weirder than we were before... according to my kids. But that's ok. We will have clean teeth. Weirder?! You make me laugh.....ah, yes, the teenage mindset. ;) Not to worry, the twenties will be along soon enough to show our young'uns how uber cool and way ahead of the scene we really are. The toothpaste sounds great. Can't wait to try it. Never made a tooth paste before. But I would love to stop using those toxic ingredients. Will also try to make a toothpaste myself .